Three teams are new to the TP52 Series on the 2010 Audi MedCup Circuit. The pressure is growing as the official practice race for the Portugal Trophy is scheduled for Tuesday. Wind conditions have been near perfect for final tuning and testing. 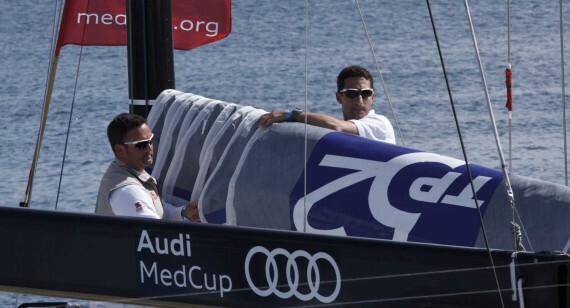 As the welcome spring sunshine warmed the docksides around Portugal’s Marina de Cascais, pushing the mercury back up to more seasonable daytime values, so the tension is also rising as the start of the 2010 Audi MedCup Circuit is just two days away. Wednesday will see the first points-scoring races for the TP52 Series. Today (Monday) saw all 11 TP52’s on the open waters off Cascais making best use of the excellent 10-13 knots of NW’ly breeze. For the well prepared crews this was an ideal opportunity to speed-check against what are considered the form teams. Others are still up very much up against the clock in their quest to be fully competitive by the time that Race 1 of 2010 comes under starter’s orders at 1300hrs local time. Informal racing since Sunday seems to have confirmed that 2009’s prime movers have given nothing away in the new 2010 TP52 configurations. Emirates Team New Zealand, the defending champions, won at least two of Sunday’s ad-hoc skirmishes, and Matador (ARG), fourth overall in 2009, have been quick – showing the benefit of their solid training and early season race programme in Palma and Valencia. 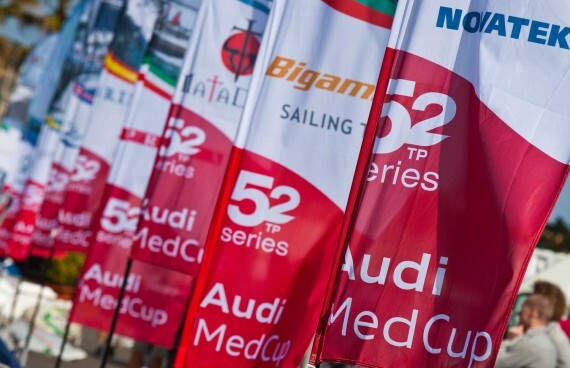 Three TP52 teams are new to the Audi MedCup Circuit. Britain’s TeamOrigin have four times Olympic medal winning Ben Ainslie (GBR) steering the only new build TP52 boat this season. Their radical looking design, the first MedCup TP52 by Argentina’s Juan Kouyoumdjian is using small winglets on the back edge of their keel bulb. By all accounts, so far the not-so-secret weapon may be contributing to their good upwind speed, but the jury is still out on their downwind speed. 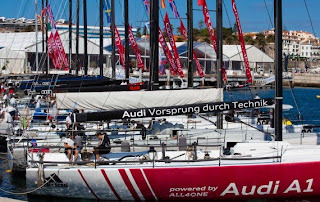 And, for all that their afterguard have a clutch of seven Olympic medals between them, the majority of the crew are rookies when it comes to the finer points of setting up and racing in the TP52 class. 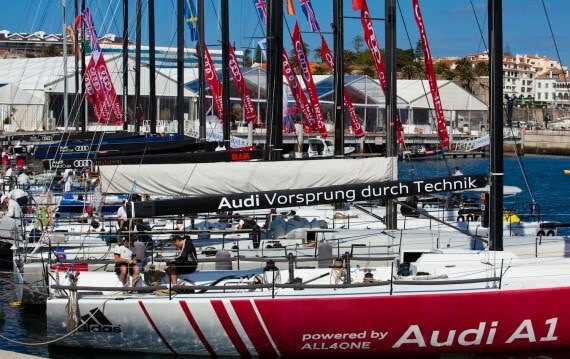 Sunday was just the first day of training on board the Franco-German Audi A1 powered by ALL4ONE and Monday morning Germany’s four times Olympic medallist Jochen Schuemann, skipper and tactician, admitted that they still had technical issues to deal with, as well as trying to get their crew-work up to speed before Race 1 gets under way. Schuemann is no stranger to the class, skippering Platoon powered by Team Germany to fifth place. Even if the most medalled of all the Olympians here, Brasil’s Torben Grael has had just one day sailing so far with Italy’s TP52 newcomers Luna Rossa, but their sailing team is one of the strongest, their 2008 build Rolf Vrolijk design is a good allround boat and they are tipped to be serious contenders this season. A relatively moderate, modest start may be expected for the start of the regatta but winds are forecast to increase through into the weekend offering the promise of the exciting, adrenalin fuelled action which the Audi MedCup Circuit has been known for. Ahead may be a long, gruelling season of up to 50 races at five regattas in four European countries, but all contenders in Cascais know the importance of making the best possible start. With four America’s Cup teams amidst the 11 strong TP52 Series fleet, and a high number of Olympic medallists, the bar is set still higher than ever. The five strong GP42 fleet is assembling in readiness for their first practise race, scheduled for Wednesday. For the first time the live Audi MedCup TV programming starts Wednesday on www.medcup.org, beginning 10 minutes before racing is scheduled.